The weather over the past couple of weeks has been one of contrasts, beautiful blue skies a week ago and then a heavy fall of rather wet snow this week. I feel very sorry for the sheep and their new born lambs – what a welcome to the world! I did see a swallow in the middle of April but I think they may have turned round and headed back south again. 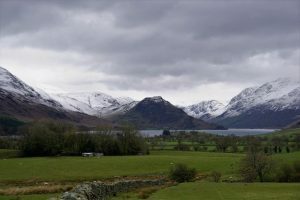 While thinking of birds, I saw one of the Bassenthwaite osprey wheeling over Derwentwater: I hear they have now got three eggs in the nest. I haven’t heard a cuckoo yet! On one of the beautiful days in the middle of the month, I took the shuttle bus to Grasmere to see the Go Herdwick sheep there. 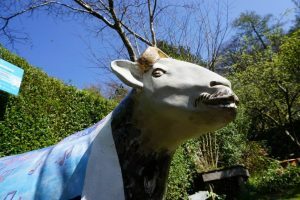 The one I really wanted to see was Herdy Mercury at Dove Cottage and he didn’t disappoint! He is well positioned in Dorothy’s garden – I wonder what she would have put in her diary! 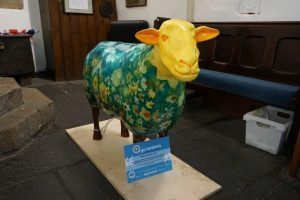 They are all beautiful and very different – Dilly, a surprise in St Oswald’s church, was covered in daffodils! I’m looking forward, as everyone else is, to the reopening of the A591 scheduled for Friday 13 May, so I can get along to Ambleside and Windermere to see some more of the flock! 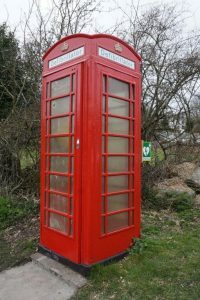 The phone box at the road junction two fields down in front of Foulsyke has got a new lease of life! It has been repainted and is resplendent with gold crowns on the top: it now houses a defribrillator. Couldn’t resist going out to take this photo as I write! Heard the first cuckoo on Thursday (5 May) – bit later than usual but lovely to hear him again! 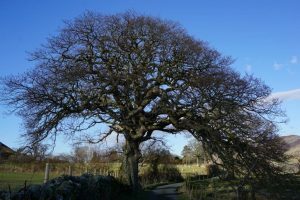 Walking along the lane on a sunny day the old oak trees look particularly beautiful. However Spring now seems to be properly on the way, lambs are appearing in the fields, there are daffodils everywhere and the birds are singing. 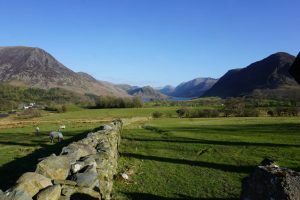 It was a beautiful day yesterday so Judy and I decided to walk over High Rigg from Legburthwaite, visit Tewet Tarn and return by the valley path. We had a super walk, the views were excellent and Helvellyn was still topped with snow. 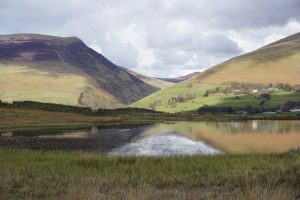 We watched the shuttle bus convoy wending its way slowly down the far side of Thirlmere and listened to the skylarks – there seem to be quite a lot about, I saw some on the slag banks at Workington when I took Wattie for a short walk up to the cross. 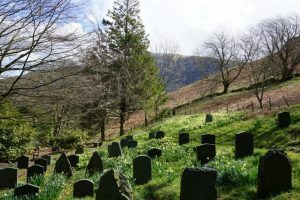 The church yard at St John’s in the Vale was a mass of daffodils. We picnicked in the sun at Tewet Tarn and watched a coot setting up a nest in the reeds before returning along the valley. A lovely day! Sheep are the excitement of the moment, and that’s apart from the ones in the fields with their lambs! 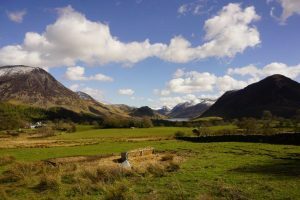 I went to the preview of ‘A Shepherd’s Life’ at Theatre by the Lake last week – it was absolutely brilliant and is getting excellent reviews all round. If you get a chance, do go to see it. 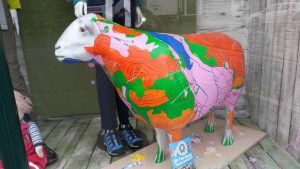 The other sheep getting a lot of attention are on the Go Herdwick trail – it is great fun and I’m hoping to see them all over the next few months, the one I am really looking forward to meeting is Herdie Mercury at Dove Cottage in Grasmere! The sheep below is Fell Top Georgy the 59th at George Fishers in Keswick.